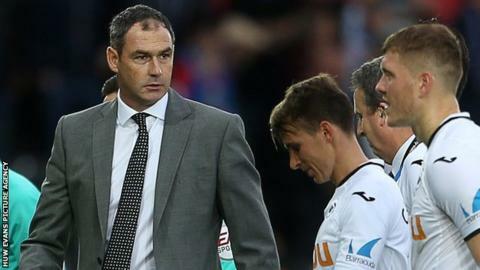 Swansea City head coach Paul Clement says his squad is "imbalanced" and has hinted he will look to improve it in the January transfer window. Swansea are 15th in the Premier League table having won two out of their eight league games this season. The Swans' summer net spend was the lowest in the league and three of their six signings were central midfielders. "The balance is slightly off because we're a little bit heavier in midfield than we would like," said Clement. "We're a little bit short at the back, particularly the left-back spot. Martin [Olsson] is playing and who's pushing him? If there is an issue, who would be able to step in? "You'd be asking a player who's not a natural left-back or you go down into the next level at your club. "We've got a slight imbalance there." The lack of balance in Swansea's squad was encapsulated by the signing of midfielder Sam Clucas from Hull for £16m, with left-back Stephen Kingsley moving in the opposite direction. That left the Swans with only one specialist left-back, Olsson, but with a surplus of central midfielders. With Leon Britton, Leroy Fer, Ki Sung-yueng and Jay Fulton already at the club, the signings of Clucas, Roque Mesa and Renato Sanches took the club's tally of midfielders with first-team experience to eight. Although Mesa cost £11m from Las Palmas, neither he nor Clucas were included in the team for Saturday's defeat at home against Leicester. Despite the abundance of midfield options, Swansea's lack of creativity was laid bare once again as they slumped to a fourth loss from five home league games this season. They have struggled to fill the void left by Gylfi Sigurdsson's £45m move to Everton, with the Icelandic playmaker scoring nine goals and providing 13 assists to help save the Welsh club from relegation last season. Swansea made a profit of almost £30m from their summer transfer dealings and, following an indifferent start to this campaign, Clement might get the opportunity to reinvest some of those funds when the transfer window reopens in January. "I've got the squad I have until 1 January, so no complaints or whingeing or moaning about it," he added. "I've just go to get on with it and maybe then we can address some of the balance issues when it comes to January. Maybe."